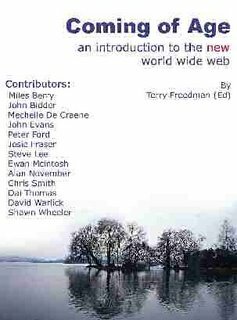 Needless to say I am still catching up on reading after the summer break.....have been reading Terry Freedman's newsletter and information about his book 'Coming of Age', an introduction to the new world wide web' which is available for free download from his website. I have recommended this book before and have it sitting on my desk ready to flick through when I need a ready reference for a Web 2.0 idea or tool. It contains articles by some of the most switched on practicing and consulting educators of the 21st century, including David Warlick, Miles Berry, Peter Ford, Alan November, Ewan Mcintosh...and more. Tonight however I find out Coming of Age is being updated and Terry is calling for volunteers to get involved with writing, proof reading and providing case study material. To keep updated read the Web 2.0 Booklet weblog and subscribe to the blog RSS feed as well. I am delighted to see a wider collection of authors for this new edition including Vicki Davis (Cool Cat Teacher), Joyce Valenza and Miguel Guhlin. Terry also has an educational podcast (feed) and the book update podcast can be downloaded here where he talks about the rewrite and update of the book. I loved the initial printing book and am gearing up to work on my chapter "Web 2.0 in the classroom." This sort of collaboration is an example of the types of work we must continue to do collaboratively. As we participate and cooperate, we model the behaviors we are trying to teach our students.